All Physiocare physiotherapists are highly qualified members of the Australian Physiotherapy Association. All our physiotherapists are highly qualified members of the Australian Physiotherapy Association. Complimenting our physiotherapists is a team of experienced massage therapists. As a client, you can feel comfortable knowing your area of concern will be appropriately addressed. Anthony is the Director of Physiocare and an experienced APA Sports and Exercise Physiotherapist, which acknowledges his expert training, knowledge and experience in sports related physiotherapy. Anthony holds a Bachelor of Science degree in biochemistry and anatomy, an Applied Science degree in Physiotherapy and a Master Degree in Sports Physiotherapy. 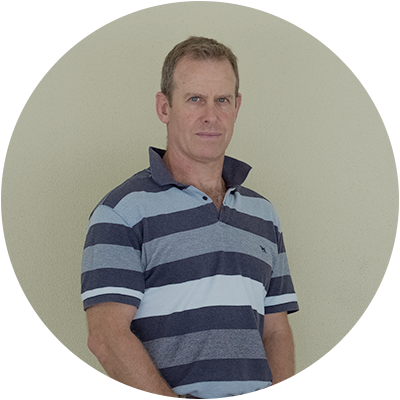 He graduated from Sydney University in 1998 and prior to moving to the Sunshine Coast Anthony was an officer in the Australian Army serving as a physiotherapist. Anthony has extensive experience in occupational and sports rehabilitation particularly relating to injury prevention and management. He regularly teaches to graduate physiotherapists at Sports Physiotherapy Australia courses and has corporate clients for whom he provides risk analysis, manual handling training and return to work case management. Anthony was a long term Rugby Union player, having played for Noosa, Eastwood in Sydney, Australian Army, Sunshine Coast and Queensland Country but has now hung up the boots. He also enjoys most sports, participating in Noosa and Mooloolaba triathlon each year, playing occasional golf and tennis and falling off the surfboard now and then. Karen graduated from the University of British Columbia, Canada in 2002 with a Bachelor's degree in Physiotherapy. She has 14 years of musculoskeletal and sport physiotherapy experience. Prior to joining our Physiocare team she was a Senior Physiotherapist at a busy Brisbane clinic. Karen has worked with triathlon/running clubs and various sporting teams over the years, including Volleyball Queensland where she travelled with the junior state teams to Nationals. Karen is an avid recreational athlete and former elite volleyball player. Through this she has an understanding of many athletic injuries and can relate to wanting to return to sport and resume the activity someone loves as quickly as possible. She maintains her fitness with regular running, swimming and Pilates, and still plays the occasional volleyball match. Karen has done post graduate training in Manual therapy, Dry needling and Pilates. She has a keen interest in core stability training both post-injury to prevent a re-occurrence and as a preventative measure to maximise both sport and daily activity function. Graduating from La Trobe University with a Bachelor of Physiotherapy in 2003, Amanda has practised around Australia in rural, remote and metropolitan places. She began her career in Echuca and has worked in many locations including Newcastle, Tamworth, Cobar and Brisbane before heading off on a working holiday around Australia. During this time she gained wide ranging experience in musculoskeletal, paediatrics, cardiorespiratory and neurological physiotherapy. She settled in Broome and began her journey into specialising in Pelvic Health and Continence, completing her Post Graduate Certificate in Women’s Health and Continence prior to the birth of her first child. Working in private practice and studying to complete her Master in Continence and Women’s Health, she had her second child. With her young family she embarked on her next chapter, to find a home on the Sunshine Coast, arriving in 2015. During her time on the Sunshine Coast she has worked in Pelvic Health at the public hospital, initially at Nambour and then Sunshine Coast University Hospital treating pelvic health conditions of the bowel, bladder, sexual and pelvic floor related disorders, including pain conditions. She is committed to continual learning and undertakes regular professional development to remain up to date with the current evidence. She is a member of the Continence Foundation of Australia and International Continence Society. When not working, Amanda enjoys exploring the bush, being in nature with her family, music and spending time with her husband and three children. Kristen graduated from the University of Connecticut in the United States with a Bachelor’s Degree in Exercise Science in 2008. She then went on to complete her Doctorate of Physiotherapy at Bond University on the Gold Coast. She graduated in 2011 and has since worked in musculoskeletal physio. She has experience doing sideline physio with rugby league, AFL, and soccer and has worked with a range of athletes from Q Cup to Cyril Connell and Mal Meninga reps teams, and sporting excellence programs with high school students. Kristen has completed her Graduate Certificate in Sports Physio through LaTrobe University in Melbourne and hopes to finish her Masters in the near future. She has completed courses in dry needling as well as a variety of courses exploring the effect of the fascial and visceral systems on musculoskeletal pain. She has particular interest in working with kids, but enjoys treating people of all ages and backgrounds. Kristen and her husband have spent the last 2 years working and travelling in the UK. Since returning to Australia they have newly settled on the Sunshine Coast. She loves to visit new places and is always looking for a new adventure to go on. Starting out her career at age 16 as a volunteer sports trainer, Holly has a natural interest in sports medicine and sports injury management. Holly went on to study her Diploma in Remedial Massage in 2001 while she worked as a massage therapist in a sports physiotherapy practice, deepening her understanding of sports injuries and management and working with athletes and sporting teams. Understanding the importance of self-care, Holly went on to complete her Stretch Teacher training in 2011. Her small group and private stretch classes enabled her to share the wonderful benefits of stretching that perfectly compliment massage treatments for longer lasting results. Over the last almost 20 years, Holly has enjoyed working with a wide variety of people from office workers to weekend warriors and busy parents to elite athletes and sporting teams. Her area of expertise is in soft tissue work and her ability to hone in on areas of concern using her understanding of structures involved in musculo-skeletal dysfunction or conditions. She likes to keep things simple and uncomplicated; restoring and maintaining normal and pain free mobility as quickly as possible is what she aims to achieve for each client. Holly strongly believes the best, sustainable results come from a multi-pronged approach specifically tailored to individual circumstances and lifestyle and will happily link in with existing physiotherapists and other health professionals. Holly has recently moved to the beautiful Sunshine Coast from South Australia with her husband Joel and two young children, Archer and Isla. She loves the beach, family picnics, cups of tea in bed, french patisseries and snail mail. But not spiders. She hates spiders.